Here at Epic, we appreciate that not everyone will appreciate loud fireworks. As such, we have compiled a quick reference guide to cover all of the low noise fireworks that we have available in our range at this time. These items will focus mainly on visual effects and colours rather than the usual screeches and reports making them family friendly for all, including the very young and elderly. Bazooka Bomb – Excellent value pack of rockets which will not break either the bank or the sound barrier for a pack of 5 rockets at £2.16 INC vat each rocket equates to 43p each. Mixed-effects including crackles, falling leaves and purple and blue stars. The noise level is 2/10 so brilliant for all the family. Superstar Selection Box – This wonderful little selection box from Marvel fireworks contains 13 mixed effect fireworks costing £3.24 and has a noise rating of 2/10 Containing a number of fountains, a couple of mines and a Catherine wheel, like its compatriot Comet Dust, it represents excellent value for money. Comet Dust Selection Box – Another low noise selection box containing 11 small fireworks with 8 mixed fountains 2 multi-shot roman candles and a single Catherine wheel. This is a great value box which ticks all the boxes for those who are unsure whether the little ones will scream the place down before you go out and buy some display items!! Glitzy Blitz Fountain – The Glitzy Blitz provides a fantastic 10-metre tall shower of molten lava that keeps going and going, engulfing the surrounding area with beautiful bright light. Low noise rating of just 2/10 this spectacular fountain is staggeringly good – Excellent for weddings and very popular for the festival of Divali. Gunpowder Plot Barrel – This pack of five rockets is priced at just £2.88 making each of the rockets costing just over 57p each represents great value for money. Furthermore, each of the rockets has a different effect which is detailed on the rocket so you know in advance what to expect. Halo Fountain – This beautiful fountain from Standard fireworks is perfect for the garden or a small display and with a noise rating of just 2/10 it has some lovely effects including yellow, red and blue stars. Costing £2.70 each they are great value for money too. Magic Stars – This is a lovely little barrage which is great again for those who find noise a little disturbing. Rated with a noise rating of just 1/10, this fires 24 shots of coloured red, green and gold comets high into the sky and lasting around 20 seconds it is great value for money at just £1.20 including VAT. Moving Target – A great addition to any display and a beautiful piece which whilst very quiet, is really bright with 105 shots fired in a spectacular zig-zag pattern. Fast firing this one is great when fired either alone or in multiples. Costing £10.80 inc VAT, they are half the RRP and would be suitable for all the family with a noise rating of 2/10. Silver Spirals – This is one of my own favourites as it can be used either alone or incorporated into a display. This 16 shot barrage sends spiralling silver tails skywards and although a little louder with a noise rating of 5/10, it is still suitable for most of the family and with a very reasonable price tag of £3.95, it will be a great addition to your show. Top Hat – The Top Hat is a brilliant little fountain from Standard Fireworks, with several different effects and an excellent duration. With effects including red, green stars, and crackles. This really is a superb garden display fountain with excellent value and effects. With a noise rating of just 2/10 and priced at £4.32, this has been one of our biggest sellers for the last couple of seasons. The fact of the matter is, we offer you the best value for money and the best products on the market at a massively reduced price as we buy in bulk to enable us to sell them on to the customer for less than anywhere else. If you are passing along the M1, come along to see us just off J36 of the M1 heading to Sheffield North and we are here 7-days a week. 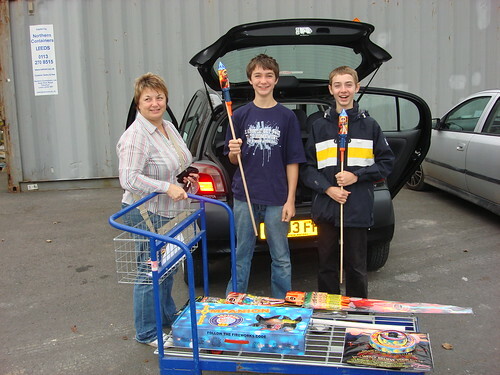 So whether you are looking for a small pack of fireworks for your child’s birthday party or for a special family gathering of any sort, let us know and we will do our best to make it a party to remember.